Create a simple yet chic home decor statement with this Blazing Needles microsuede blackout curtain panel pair. Constructed from premium microsuede fabric, these 100 percent polyester curtains block the sun while injecting your space with a pop of color. The included tiebacks give you greater control of the amount of light that comes into the space. This feature helps you customize your surroundings to take advantage of soft morning light and block out harsh early afternoon rays. 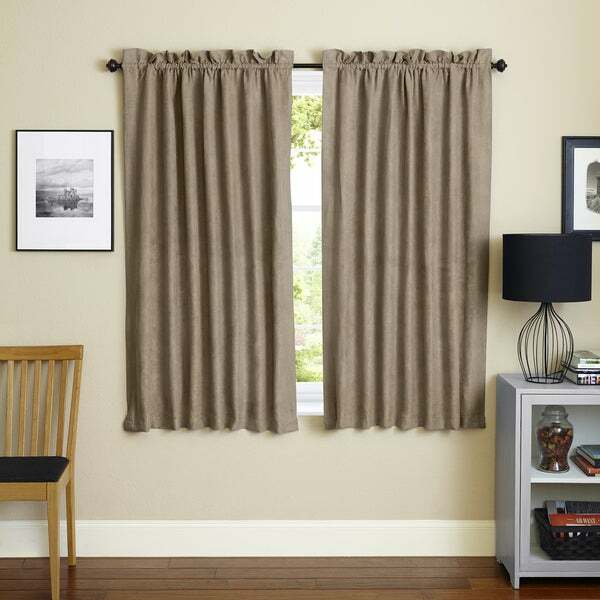 Traditional three-inch rod pocket design construction allows you to slide the curtains on and off a standard-sized curtain rod with ease. Spot clean each panel, when necessary, right after a spill to keep the set looking its best over the long haul. I got these curtain panels in the grey color for my daughters bedroom and she loves them. They hang nicely and block the light but I would not say they are blackout (maybe because they are on a west window that gets a LOT of sun). They are a tightly woven fabric that is smooth on the back (not the suede texture) and they do not have that white foam backing .... they rely on being tightly woven to block the light. We are very pleased with these curtains and I am getting them in another color for our sewing room. I purchased the sage curtains. My bedroom has a sage wall and a bedspread with sage accents. I liked the microsuede look, but the curtains ended up having more of a yellow hue to them. It also does not blackout the room. The sun still shines through. I kept them for a while, but ended up getting something else due to color bugging me. I love these curtains and they keep the sun out as well.. I bought these because I thought the micro suede looked nice, and it does, but there's not enough material to block the light. Compared to other blackout curtains side by side, these let a lot of light through. 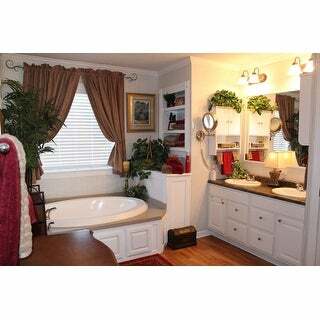 If you just want them for the appearance, they are nice, but if you want a dark room, best to look elsewhere. Very rich looking. Just what I wanted for my bathroom. Love the color. The fabric was nice and substantial, but unfortunately the shade of aqua blue didn't go with my bedding so I ended up returning it. Really darkens a room. It was a good buy. Not even close to black out. Light can be seen thru them. Micro-suede-ish...ordered dark brown...it is brown but more cocoa and not a fan of the material. "Can these be used on a traverse rod?" I needed short length curtains and the price was right.